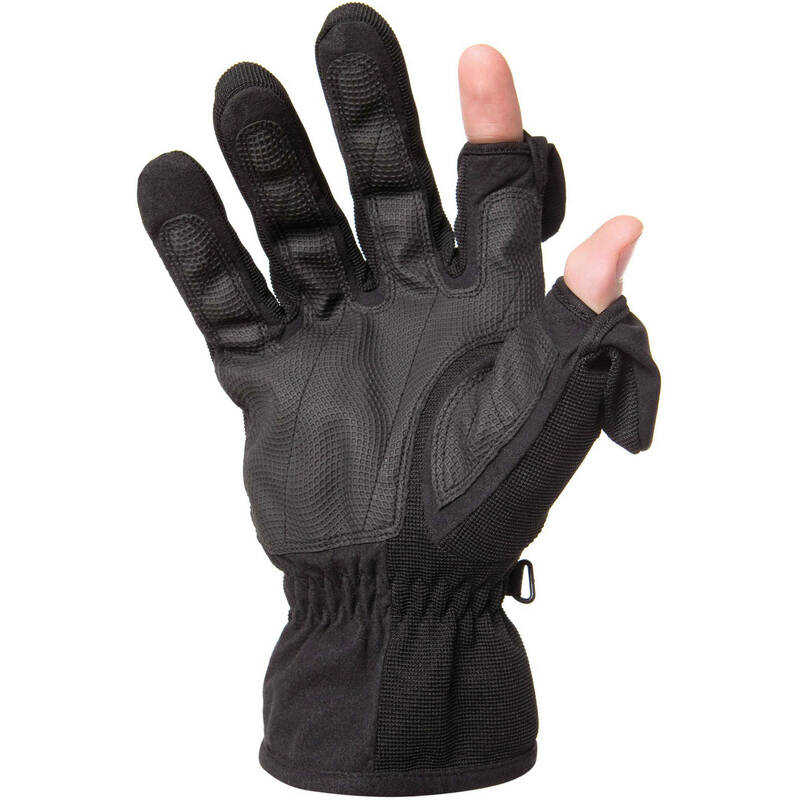 This pair of x-large black Men's Stretch Thinsulate Gloves from Freehands are designed to be used when photographing outdoors in cold weather. The gloves have a waterproof and windproof backing and are lined with Thinsulate to keep you warm in the winter while being lightweight enough to wear in milder weather. Men's Stretch Thinsulate Gloves (X-Large, Black) is rated 4.2 out of 5 by 111. Rated 4 out of 5 by Taylor F. from Handy but sizing is way off I'm a professional video cameraman, I use these for cold-weather and helicopter shooting. It's great to adjust focus, small dials and buttons with bare fingers, the magnets work well in keeping the flaps back. I wouldn't use them in extreme cold weather as they're pretty thin. One particularity: if your nose runs in the cold, the fabric on the backs of these are a bit like wiping your nose with sandpaper. Kleenex is great, but problematic when hanging off the skid of a 206! Also, the sizing is waaaay off. Their chart says I'm a Large but I ordered X-Large and they're still too short on the fingers and wrist. Rated 4 out of 5 by Jim from Sizes small: Measurements & more warmth (Since I've tried both Large & Extra Large, I am reviewing them under both item numbers) 1. Sizes run small, here are some hand measurements. 2. Making them even warmer wearing by nitrile gloves underneath. 1. As other reviewers state, the sizes run small and even then the Large was too small for my slim, medium sized man's hands. I then got the Extra Large; those are a better fit and none-too-large. To save others from making the same mistake, here are my hand measurements: The standard measurement is around your knuckles with your hand extended flat with a tape measure across your palm. Do not clench your hand or include your thumb. Use your dominant hand, the right if you are right-handed, and the left if you are left-handed. My hand measures 8.5 this way and the Extra Large is a snug fit. The Large is too small. An additional measure is the distance from the tip of your longest, middle, finger to the web between it and your first (index) finger with hand flat and fingers next to each other. This is 3.5 on my hands. The Extra Large is barely long enough in this dimension for my hands. 2. My hands still get cold very quickly and easily with even the best gloves. I make these gloves a bit warmer by putting disposable nitrile gloves over my hands before putting on these gloves. This way I still have some insulation over my thumb & index finger tips when the tips of this glove are flipped open . Be certain to wash off any powder on the nitrile glove before use; you do not want any powder getting into your camera. Even then, if the temperature is below about 35 deg F (0 deg C), I still need to use a handmuff with chemical hand warmers because my hands do not tolerate cold. Rated 3 out of 5 by Frederick from Decent quality but sizes are way off These gloves are well made and would be a great value except for the fact that the stated sizes are so far off. As has been stated in other reviews, these gloves are generally one to two sizes smaller than the manufacturer states. My hands are not large - usually size medium gloves are very snug, while size large are just a bit big on me. After reading the other reviews, I ordered the largest size available, XL. They turned out to be smaller than most sized medium gloves. They quality and design are pretty good and I would have been happy if they fit. As it is, my wife will have them as it is too much of a hassle to return them. Rated 5 out of 5 by John M from Excellent product overall Bought the gloves for cold camera work outdoors. They do the job, freeing the thumb and index finger for settings while also providing a snug fit and surfaces that yield an excellent grip on the camera body. Glove wise, they are a high quality product, providing insulation and warmth. There is one caution. As per the reviews BH provided, order a size larger than the manufacturer's prescribed measurements of your hand size. My measurement indicated tight medium to OK large. After reading the reviews, I ordered extra large. Perfect fit! Thank you BH for the customer reviews! An excellent product at a very low price. Rated 3 out of 5 by Anonymous from My thumb done froze! Nice snug fit, light-weight and seems well constructed. Hand stays warm, but the flaps covering the thumb and index finger have no lining, so even though they cover those digits when not in use, they provide little protection from the elements, paticularly when temperature goes below 25 degrees. Also, I have large hands, but had to buy an extra large size, and even that is a snug fit! Rated 2 out of 5 by Alton from Magnets in the thumb and index fingers I put these on at 21 degrees. Within a few seconds of stepping outside I felt coolness on the thumb and index fingers where the caps pull off and fold back. Still it is better than nothing at all. I intentionally left these gloves on to get the keys out of my pocket, and once in the car I pulled a Kleenex out of the box. I was able to get a single tissue, meaning you can handle your small gear easily with these. I got what I thought was the right size for me but they didn't come up high enough on the wrist. I noticed two magnets on the thumb and index finger so you can fold the tips back and keep them out of the way. So, don't take your memory card out with these caps in place, given that there is a rather strong magnet over the fingernail of the index finger and thumb. The leather front of these gloves worked great for gripping things, and would be good for cold metal tripods. Rated 3 out of 5 by Darryl from Practical, almost (but not) perfect Look great, feel great, clever (tiny magnets hold the tips open), are well constructed (i've had one run over by many cars and buses - i thought i'd left it in a Manhattan taxi but found it on the road 40 mins later), easy to pop the ends off/on to expose/cover the fingertips. Their one, but significant,flaw? Although everything else IS lined, the removable tips (thumb and first finger) are NOT lined, so you get a bit cold pretty quickly,especially as there is an open join there too. Seems like a silly design oversight to me. I'll be wearing thin liners underneath in the cold. Which kinda defeats the purpose. Is there a sizing guide for these gloves? It seems that the consensus here, is that these gloves run small, and I would have to agree. My hand measurement is 9 with translates in to a size M on this size chart. I ordered a size L, and it's way too tight. Are these gloves really waterproof? Water repellent; not water proof.